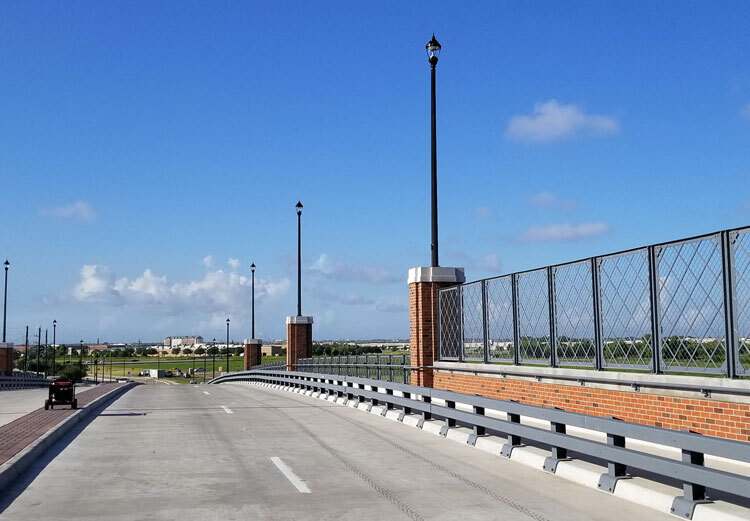 Houston — The American Council of Engineering Companies (ACEC) Texas awarded civil engineering firm Lockwood, Andrews & Newnam, Inc. (LAN) a gold medal for its work on the University Boulevard Extension project for the City of Sugar Land. The award, given under the transportation category, will be presented during the ACEC Texas Engineering Excellence Awards Gala at the Four Seasons Hotel in Irving, Texas, on March 23, 2019. The Engineering Excellence Awards Competition has been held by ACEC Texas since 1975 to honor and recognize outstanding achievements within the engineering community. A panel of judges around the state select projects based on innovation, future value to the engineering profession, social and economic considerations, complexity and exceeding the client’s needs. This is the fourth gold medal award won by LAN in the last five years. Spanning half-a-mile, the four-lane, divided, north-south connector extends University Boulevard north from the US 90A intersection along the west edge of the business campus of Nalco Champion, a supplier to the oil and gas industry. The route then bridges over Oyster Creek and a Union Pacific Railroad spur before finally merging with Stadium Drive, which runs along the city’s newly built minor league baseball stadium, Constellation Field. The scope of the project included reconstruction of a portion of US 90A, track work with UPRR, a new at-grade rail crossing with traffic signal preemption at US 90A, a grade-separated overpass over a UPRR spur and Oyster Creek, a side path and sidewalk, retaining walls, and a bridge-supported water line. LAN served as the project’s design engineer. Harper Brothers constructed the road and bridge portions of the project while Webber constructed the rail portion. The extension, which opened on June 14, 2018, provides a critical connection to US 90A, diverting traffic from neighborhood surface streets and alleviating congestion on State Highway 6. Ultimately, by 2025, the extension will help increase capacity in University Boulevard by 12,000 cars a day, according to the city’s estimates. The project also spurred Nalco Champion to consolidate its Houston-area offices and centralize its headquarters in Sugar Land. In March 2016, Nalco completed the construction of its new 133,500-square-foot headquarters with 1,000 parking spaces. The company reconfigured its existing buildings to maximize office space, accommodate supply chain needs, and create additional space for the expansion of the company’s research and development facilities. This move brought in more than $45 million in investments, the retention of 342 jobs, the recapturing of 247 jobs previously based in Sugar Land, and the addition of 862 new jobs. In addition to enhancing north-south mobility, the extension provides easy access to some of the city’s biggest attractions, including Constellation Field, the home of the minor league baseball team the Sugar Land Skeeters, the Smart Financial Centre concert arena, and the Imperial Market. Finally, the extension has provided new opportunities for developers. In 2017, Johnson Development Corp. opened a four-story, 200-unit apartment complex for residents 55 years and older. Other projects that are currently underway or on the horizon include significant commercial development within the Imperial Redevelopment District.